What's Your Favorite Faberge Egg? My Favorite Faberge Egg is the Alexander Palace Egg. What's your favorite egg? 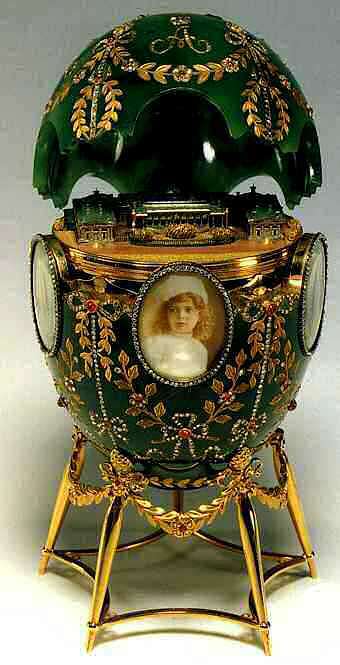 Many people have never seen a Faberge egg up close and personal and have no idea what's even on the Faberge eggs list. That's why I created a Catalogue of Imperial Faberge Eggs so visitors can join the Easter egglomania and pick their own favorite egg. What's Inside My Favorite Faberge Egg? Armoury Museum of the Kremlin, Moscow, where the Famous Kremlin Diamonds are also kept. The nephrite egg is adorned with five miniature portraits of the children of Tsar Nicholas II and Alexandra Fedorovna, and contains a replica of the Alexander Palace at Tsarskoe Selo. The upper and lower sections of the egg are set with triangular diamonds bearing the initials AF (Alexandra Fedorovna) and the date 1908. An inlaid wreath of golden leaves surrounds each diamond, and flowers composed of rubies and diamonds. 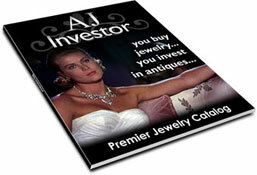 Find the Facts About Diamonds Here. The surface of my favorite Faberge egg is divided by five vertical lines, studded with diamonds and connected with one another by gold garlands inlaid with rose-cut diamond and ruby flowers. The oval portraits of the children are executed in watercolor on ivory and framed in diamonds. Above each portrait is a crowned diamond monogram and the first initial of the child represented. French Tutor, Pierre Gillard spent more than a decade at the Imperial court teaching the Imperial children French. In his remarkable memoir called, Thirteen Years at the Russian Court, (London, 1921) Gillard gives his impressions of the Tsar’s four daughters. The replica of the Alexander Palace and its adjoining gardens is the "surprise" and is concealed within the egg. Executed in tinted gold and silver, with rock crystal windows and a light green enamel roof, the model is mounted on a gold table with five high, narrow legs. The Alexander Palace, even though quite modest, was the Imperial family’s preferred residence at Tsarkoe Selo. The palace was built by the Italian architect Giacomo Quarenghi, in the late 18th century for Catherine the Great’s favorite grandson, Grand Duke Alexander Pavlovich, who would become Tsar Alexander I. The egg was presented to Alexandra Fedorovna at Easter in 1908 as a gift from Nicholas II at a cost of 12,300 rubles and housed in Alexandra Fedorovna’s Mauve Sitting Room in the Alexander Palace from 1913-1916. The stand is modern and was made in 1989 at the Moscow experimental jewelry factory. Between 1885 and 1916 some 54 of these amazing Russian Easter eggs were commissioned by the Tsars Alexander III and Nicholas II as Easter presents for the Tsarinas Marie and Alexandra Feodorovna. Each one of the Faberge eggs designed by Peter Carl Faberge is a masterpiece of elegance, inventiveness and craftsmanship. If you have already looked through the Catologue of Russian eggs, which one would be your favorite Faberge Egg? Go on, don't be shy, type away and let us know the Russian easter egg you would choose. It's simple. Just fill in the form below. Which Faberge egg is your favorite egg and why? Your story about your favorite Faberge Egg will appear on a Web page exactly the way you enter it here.